A classic sprinters’ stage follows a pattern. An early series of breakaways goes off until one move sticks. The teams of the yellow jersey and the key sprinters make tempo at the front. With 50 km to go, Maxwell’s Silver Hammer comes down and the chase begins in earnest. With ten km to go, the break is caught. A truce is declared for two km, and then, the teams line up their sprint trains whilst the specialist climbers hang on to the tail end of the lead group. 15 MI/24 km to go: It’s raining. Not hard, but enough to make the roads as slippery as ice on ice. The group is together coming through an area surrounded with more than the usual TdF signage. A rider near mid-field taps his brakes to slow for a flapping banner. The rider behind slams into him, and the dominos begin to fall. Men are sliding across the paint stripes like fallen hockey players. Wet paint stripes are the black ice of racing cyclists. The road is completely blocked as perhaps 2/3 of the field is held up. Meanwhile, at the front, an informal truce has been declared. The forty men in front are rolling along at 21-22 mph, as a group of twenty motor-pace back into the bunch behind a neutral service car. Illegal, yes. Unethical? Not so much. Several others, in groups of threes, fours, and more, are also chasing through the cars. 7 MI/11 km to go: The main field is back up to speed. A second peloton has formed behind. They are already 7:35 in arrears. At the finish, they will have lost 14:35 on the day in 15 miles. The rains have stopped. The headwinds have not. All of the main GC riders are present. The sprinter teams and the GC teams join in a dance. This dance, of course, reflects the needs of the individual teams. The GC teams must keep their riders safe near the front. Yet, they also respect the needs of sprinters teams for a clear and safe sprint. The sprinters’ teams must be tactically alert as the sprint winds up. It’s a complicated dance, more paso doble than pavane. BMC leads as Le TVG stays safe. Astana rolls up to the front on the left side for Nibbles. (Nibbles, you say? Yes, on the LiveUpdateGuy.com site run by Charles Pelkey, nearly every top rider earns a nickname, regardless of how tasteless said nickname might be.) Team SKY shows their faces to the wind, just to the right of BMC. 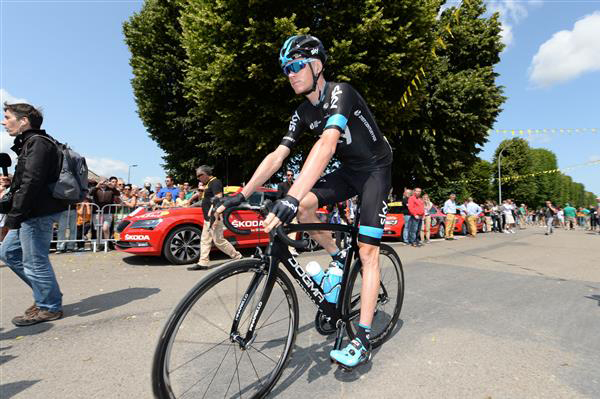 Froome looks as comfortable as one could. 3.1 MI/5 km to go: Where is everyone? The GC teams still lead the wind-up. BMC, Team SKY, and Movistar are at the front - all poised to keep their guys safe. Here comes Tinkoff to the front, too. There are four parallel strings of riders. It’s like a simultaneous team time trial. 2.4 MI/4 km to go: That is one huge roundabout. It’s like Clark Griswold went on vacation in Amiens - Hey, look kids-there’s Big Ben! How big? The riders who took the left side of the roundabout lost about twenty places as the lines merged on the far side of the road. 1.5 MI/2.5 km to go: Tony Martin takes to the front for Cavendish. Quite a coup for Etixx, to have the world’s fastest road time trialist drive the lead-out train for one of the finest sprinters in the world. 1 MI/1.6 km to go: The Giant-Alpecin team, enlivened by their caffeinated hair, takes over for Degenkolb with the green jersey Andre Greipel (Lotto-Soudal) on his wheel. That’s a good place for Greipel to be. 0.6 MI/1 km to go: Red Kite Time! All the big guns are here: Alphabetically-Boassen-Hagen, Cavendish, Degenkolb, Greipel, Kristoff, Sagan – No one is hiding in the wheels, this is a drag race into a stiff breeze. There goes Kristoff-he looks like he could rip his handlebars into pieces. Here comes Cav, this wind is perfect for him-the most aerodynamic of sprinters. Holy mackerel, look at Greipel! He’s lit it up. He closes down two bike lengths and opens up one more for good measure on Cav in the last twenty meters. Sagan’s no fool. He’s up there for second place in the cross wind shadow of the giant German. Again, it’s a German winner. Two days in a row! Ausgezeichnet!! 1) The teams with GC contenders recovered well after yesterday’s pounding on the cobbles. All the major teams kept their riders safely at the front of the field throughout the day’s bad weather, and the huge crash at 25 km to go. That bodes well as the next three stages across Normandy and Brittany may not be mountainous, but there is always wind. 2) Tony Martin, like Cavendish, is a true teammate. Yesterday, we saw Cav working hard for Tony. Today, with 2.5 km to go, there was Martin laying down the law at the head of the Etixx train for Cavendish. 3) Professional cyclists can do things on their bikes that others cannot. With 100 km to go, Geraint Thomas was sitting fourth wheel in the bunch. It was windy. The field was rolling along at 45 kph. He sat up, took both hands off his bars, unzipped his jacket, folded it, and stuffed under the tail of his jersey. Not only did he not lose a place in the field, he didn’t miss a pedal rev, nor did any of the other guys at the front take any notice of his sartorial gymnastics. That’s trust you have to earn. 4) Greipel possesses an incredible set of afterburners. Off by himself, fifth man back with 150 meters to go, Andre the Giant blew past every one like a man sprinting around a derny on the velodrome. Except he was sprinting at 36 mph into a flag flapping headwind. Sagan, Cavendish, Kristoff, Edvard Boasson-Hagen, Degenkolb-they all had a chance to hold off Greipel, but not one of them had the strength. Random Greipel fact. He is from Rostock, Germany. Rostock is on the Baltic, and a stone’s throw from Denmark. More importantly, it is the hometown of Jan Ullrich. 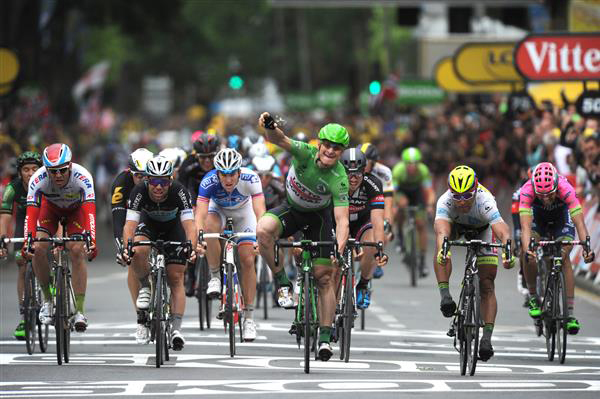 Andre Greipel was 15 when Ullrich became the first German to win the Tour de France. Today’s question: Jan Ullrich admitted to drug use late in his career. His 1997 Tour de France victory is surrounded with circumstantial evidence that might indicate he was doping in 1997. He is still listed as the 1997 champion. What’s your take? Head over to the McGann Publishing Facebook page and state your case. You can also follow BikeRaceInfo on Twitter. Today is not a typical sprinters day. In the main, the roads are flat, with a handful of category 4 climbs, but the last five kilometers are very twisty as the race enters Le Havre. The final 1.5 km is uphill. It’s not a pure sprint finish. The race closes on a short 7% climb. The climb levels slightly for the last 500 meters. Whilst not super-steep, at the end of 190 km, it is steep enough. For reference, the race has already tackled the Mur de Huy with its average gradient of 9.5% and steepest incline of 26%. The TV commentary touts Sagan and Degenkolb, both decent climbers and sprinters, but my choice is Valverde. 13 MI/21 km to go: A group of three is away: Perrif Quemeneur (Team Europcar), Kenneth van Bilsen (Cofidis) and Eritrea’s Daniel Teklehaimanot (MTN-Qhubeka). The move was instigated 3.1 MI/5 km into the race, and has a 61 second lead. That lead will not last long. It’s time for the sprinters’ teams to ramp up the chase. However, a stunning and truly awesome world sporting event has just occurred. By winning the points at the last KOM of the day, Daniel Teklehaimanot has just put a lock on the King of the Mountain jersey for today’s podium. No African rider has ever earned a leader’s jersey before. A great moment for Daniel, his team, Eritrea, and for cycling. As an added bonus, the MTN-Qhubeka team kit is the coolest looking kit in this year’s peloton. The GC contenders’ teams have spread across the field. This shuts down any attempts to fire an escape up the side of the road. Each leading team is well-represented across the field as they roll up along 50 kph. At the back, guys are standing on the pedals to stretch out their low backs. Plenty of men are bending over to snug up their shoes. In a few kilometers, it will be far too hectic to take a hand off the bars to give the shoe tops a twist or click. The three men in the break continue to work together. 7 MI/12 km to go: Kenneth van Bilsen, a Cofidis Tour debutante, attacks out of the break from the back. In classic style, he lays off a bike length to the right side of the line, stands and jumps hard towards the left side, and heads straight towards the moto as he hopes to grab a moment of draft. No slouches, these moto-drivers, and the yellow moto accelerates away to deny him any help. Van Bilsen’s attack looks strong, but there is no way it will carry him to the finish. It just might earn him the red number tomorrow for most combative, and perhaps that’s his real hope. At any rate, his move gets Cofidis some serious TV time, and this whole Tour de France thing exists to satisfy sponsors. Quemeneur and Teklehaimanot are working together but they’re not working hard. I suspect that MTN is thrilled with the polka dots, and they’ll burn no more matches. 6.2 MI/10 km to go: The two men in the break reach across to shake hands as the main field reels them in. They’ll try to hide in the group and recover before the final sprint. The young van Bilsen continues to motor along with 25 seconds in hand. 5 MI/8 km to go: A roundabout and everyone is neatly through. The men on the front are on the rivet. The leader is at 46 kph, according to the telemetry, and the field is at 55. Van Bilsen’s lead is down to 18 seconds lead and the bunch has him in sight. Truth is, the young man is not even a blip on the radar to the peloton. Everyone from the Cofidis director sportif on down to folks watching on TV in a pub knows the race is in the main field, not a guy 400 meters ahead. 3.7 MI/6 km to go: On these extremely narrow roads along the channel through Le Havre, the field is single file. There is a flotilla of sailboats in the harbor where the Seine empties into the Channel. Each boat has a sail to match a leader’s jersey; one yellow, one green, white, and so on. It is striking stuff as the sunlight bounces off the water and illuminates the sails. I suspect the riders might notice it when they watch the stage on video later this evening. But not at this moment. 3.1 MI/5 km to go: The lone breakaway is at 52 kph and has 12 seconds in hand. The peloton is at 60 kph. The big teams lead the charge. BMC Cycling is right there. They have two issues. One, Keep TVG safe. Two, get a stage win for Greg van Avermaet. He’s a good tip. Greg can sprint, and he goes well on a short, steep climb. Team SKY is present and correct. Froome can be seen fourth in their line. The yellow jerseys of Tinkoff are off to the left of the field, keeping Contador safely out of the mayhem. Yellow jersey Tony Martin is right on the front Cav sitting third wheel. Cavendish can get up a hill like this. You might remember he won Milan-San Remo in 2009. 1.8 MI/3 km to go: Van Bilsen is swept up. That was a brave move. He attacks nearly from the gun, stays away for over 150 km, and the young Belgian ends the day with a suitable Gallic flourish. Chapeau, jeune homme. The peloton is at full speed down the Rue de Paris. This road is very twisty with nowhere to pass. The wheel you are on is the wheel you will stay on. At these speeds, no one would be able to attack out of the line anyway. The race diagram shows that a chicane approaches. You need courage in a chicane. You tap your brakes here, you’ll lose ten places. 1.2 MI/2 km to go: Zdenek Stybar (Etixx) leads for Cavendish. Giant is right there next to them, lining it up for Greipel. There’s Argos-Shimano on the front for Degenkolb. This finish could suit him. Where are the Movistars? Looks like they’ve backed off to protect Quintana, rather than offer a chance to Valverde. Fair enough. Have the riders underestimated the steepness of the climb? I wonder if they’re lining it up for the right sprinters. All hell will break loose in a moment. And they’re off!! Everyone is out of the saddle. At the 1 km kite, the front of the field is at 18 mph/30 kph. That’s steep. Big crash!! Right at the front, about twelve riders back. Guys are all across the road. Whew, that was some nifty bike handling by Froome to avoid the crash! Someone on the left barricade tapped the wheel in front, ricocheted across and knocked down a Giant, who knocked down Nibali. Vincenzo will be molto arrabbiata. Up at the front, an Etixx rider has jumped. It’s not Cav, too tall. It’s Stybar and he’s got a gap. Stybar hit the gas as soon as he heard metal on blacktop. Smart move. With that hesitation, Stybar has this. No way will Sagan drag everyone across the gap. Sagan throws down, opens a gap himself, and holds off the sprinters for second. Sagan must be ticked as well. Everyone, once again, is looking for Sagan to do the work. Sixty seconds after the finish, here comes the rest of the field. The Etixx squad is still waiting for yellow jersey Martin to get a new bike and finish the stage. He’s hurt. He’s very guarded towards his left side and he holds his left arm across his chest. Every cyclist worth his/her salt has broken a collarbone or separated a shoulder. We all know that position. Martin is getting pushed up to the finish by several teammates, including world champion Michal Kwiatkowski. Here comes Quintana. I think he may have gone down but he looks okay. Tony Martin was near the front, on the left side, on sprinter Bryan Coquard’s (Europcar) wheel. Coquard is glued to Sagan. On replay, you can see Coquard’s bike jump back a bit as he stands hard to accelerate. Martin rides into the wheel. Coquard bounces to the left, and Tony Martin goes hard to the right. He bangs into a Giant rider, who spins about 45 degrees counterclockwise, and smacks down Vincenzo Nibali. After that, it was NASCAR-iffic. As the crash happened within the last 3 km, and the main field finished together, everyone who was held up (46 riders) will receive the same time as bunch sprint winner Peter Sagan. Up on the podium, you can see the lump on Martin’s left shoulder front. You don’t need to be a radiologist to see that he has a fractured clavicle. He looks shocky. My bet - If Martin manages to start tomorrow, he’ll be in the car before the end of the day. That’s a sad finish. 1) Crashes happen. Bryan Coquard stands on his pedals, his bike shoots back. It’s physics. 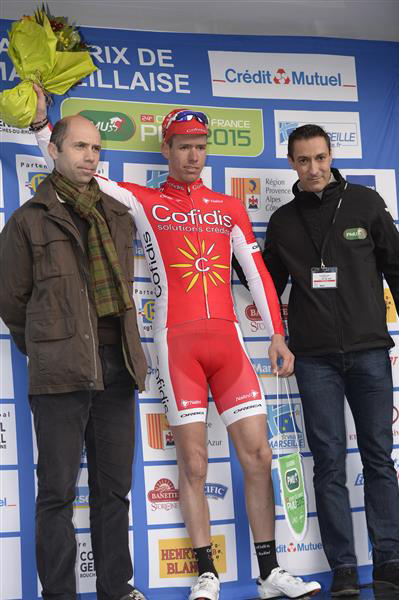 If Tony Martin is two inches to either side, no one goes down. 2) Andre Greipel, as he dons his maillot vert, looks more like an Olympic weightlifter than a cyclist. He has the most incredibly imposing physique I’ve ever seen in a road cyclist. 4) This might be the beginning of a talent explosion. 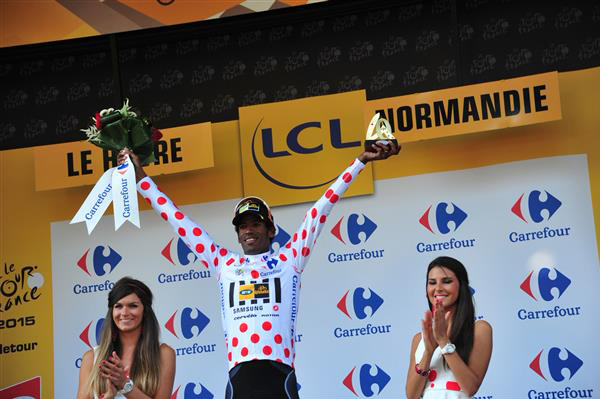 With the polka dot climber’s jersey on the shoulders of Eritrea’s Daniel Teklehaimanot, I can see every team director getting on the phone to his scouts and telling them to book a flight to any country in Africa with a nascent cycling program. And maybe, those scouts will take along a big truck of gear, to boot. Today’s Question: Is Africa the sleeping giant of world cycling? If not Africa, then where? Head to the McGann Publishing Facebook page and make your case. Follow David L. Stanley on Twitter here. Follow Bike Race Info here.